Shimonada-eki Station is a station of Yosan-sen line of JR Shikoku. 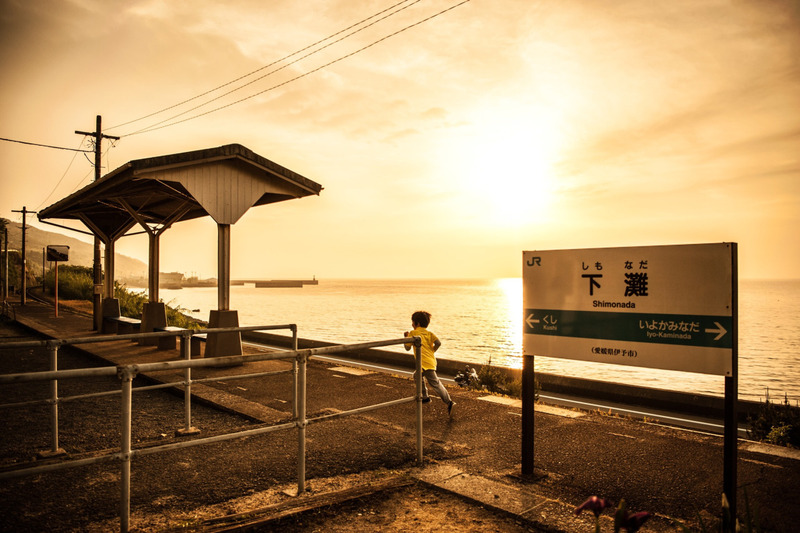 This place is known as the station closest to the ocean, it is popular also from railway fans, and it is a place where many visitors enjoy photography. It is also famous as a place often used as a shooting place for film and drama. It is also known as a spectacular sight of the setting sun, so it is good to visit that time. Shimonada-eki Station is not that big, it is a single track railway. Originally it is a wooden station building, it is an unusual station building which is still present, while it is being refurbished little by little. There is a waiting place in the station and a ticket window which is not used anymore in the other. Once at this station, the railroad and the coast were close to each other so that the waves could hit just below the platform. Therefore, it was also called “the closest station to the coast in Japan”. After that, the road opened in a way that reclaimed the sea, but still you can see the Iyo-Nada Sea from home. The “Shimonada-eki Station” in Iyo-shi, Ehime is the unmanned station which many people say “I want to get off at this station once”. What does attract them? 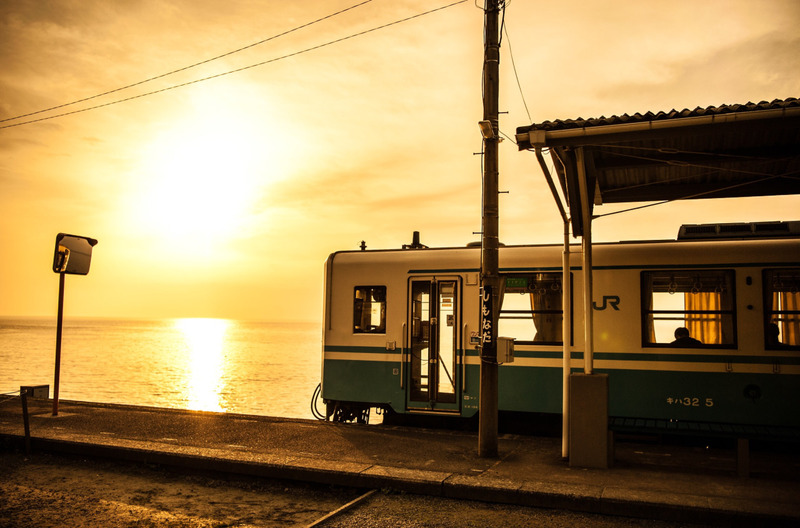 It was “the closest station to the coast in Japan” in the past, and the beautiful sea of Setouchi opens all over the very front if you go down this station. In addition, it is known as a superb view spot of the setting sun, and was used as a shooting place for a TV drama, and is often used for the photograph of the advertisement. Recommended time to visit Shimonada-eki Station is not only the day. It is the scenic spot that you can see the sun setting in the sea undisturbed anything. 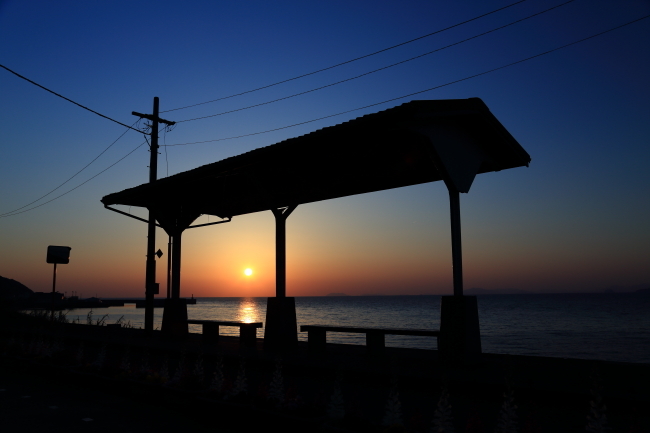 “Shimonada-eki Station” where collaboration with the sea which reflected shiningly the sunlight in the daytime, and the sky which is dyed in thin pink with setting sun when it is in the evening, is beautiful at all. It is the station which wants to stop over once. It is a station of the beautiful unexplored region which Japanese people just accept. “I would like to visit, only in order to go to see this station specially. “ A wonderful station to think of like that is this “Shimonada-eki Station”. *The fare to the Shimonada-eki Station will be charged separately.